Bitcoin-based trading websites are getting a foothold in today’s trading market. This is because Bitcoin is getting stronger by the day. The hype of Bitcoin usage over the past 6 months has been a drastic advantage in this sudden increase of trading websites that put BTC in the middle of their operations. Today, we will be reviewing one of those websites that are Bitcoin oriented. We will be looking into what Evolve.Markets have in store for traders, what their features are and their background, regulations, and restrictions, along with creating an account and starting a trade. Without further delay, let’s talk about that! Recently, we decided to talk about regulations and restrictions first before digging deep into new territory. This is to make sure that we set proper expectations for our readers to know if the website is something that they really want to look into or just another website that’s not worth their time. An active online trader would have an idea of what these regulations are and how they work. Generally speaking, a regulated trading website is usually the ones that accept real money trade or Fiat Deposits. Here at Evolve.Markets, the deposits are all in BTC (which will be discussed later on in this review). This means that the website or the trading platform is not regulated at all. There are still a number of websites that specialize in BTC trading but are registered and are being regulated by a government body. Sad to say, Evolve.Markets is not regulated by any form of a body. The company Evolve Markets Ltd. is of course, a privately owned International Business Company that was founded in 2016 and is based in Saint Vincent and Grenadines. Details of their address can be found here. Account restrictions come in hand with fiat capabilities. What we’ve noticed is that when a company or website is focused or operates using BTC, there’s little chance that they have any restrictions when it comes to having an account. Most of the time, these restrictions are often seen in websites that accept real money deposits, with BTC-only deposits, it is unlikely to happen. Restrictions are also there to limit an account to trade more than what the account holder can take. This is a security feature not only for the user’s side but for the company itself as well. Here at Evolve.Markets, they do not have any account restrictions that control the flow of funds from an account. Their website doesn’t say that much about their company’s history, which is quite odd, to be honest. As mentioned above, the company was founded in 2016 and has a registered physical office in SVG, which is a popular destination for offshore Forex trading companies. Since the company is an IBC (International Business Company) they are not obliged to follow any regulations imposed by a particular body. Which leaves their probable customers asking, who is regulating their funds? This has already been raised with the company and this can be read here. Since there is no regulatory body foreseeing the proper security for registered customer funds, the company, however, promises that they are keeping everything in cold wallets. This means that they are keeping BTC’s in offline wallets and away from their website. Now comes the second best part of the review, the account creation! The first step that we need to do is to go to their website and click on create an account. Compared to other trading platforms, creating an account here is as easy as logging in. All you need to do is provide an active email address and the password for the account you want to create and you’re all ready to go! Once the “Create Account” button has been clicked, you will be automatically logged into your account, but this doesn’t end here. We’ve tried to look around the account page but it seems that you need to click on an activation code first on the provided email before moving forward. Once an account has been verified (the email confirmation doesn’t arrive instantly as we needed to ask for a second code after waiting for 30 minutes) you are now able to go to the accounts tab found on the upper left-hand side of the page. Congratulations! You have now created an account with Evolve.Markets, now on to the best part of the review. Under the “Secure Client Area” accounts can be easily managed. What we found after creating an account was something interesting since the website offers Demo Accounts! 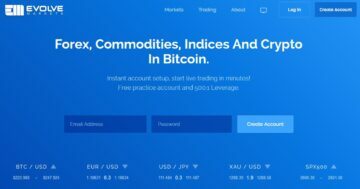 Do you guys know that it is really hard to find a trading website that offers demo accounts to practice on? It is nearly impossible to find one. However, they have it here in Evolve.Markets, which is great since who doesn’t want to have a demo account, right? The Live/Demo accounts can be accessed through this tab and adding an account to either of the selection is so easy and simple, you just need to click on the “Add Account” button on either live or demo selection. Shown in the screenshot is how to add an account. What we’ve done is that we’ve clicked on the Add account button under demo account. 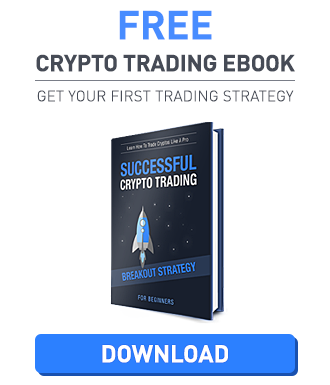 This redirected us into a different page where we need to enter a few details from the account name, password, trading type can be chosen from either Classic or Pro (the difference will be discussed later in this review), and the leverage you want to have. A selection from 100:1 up to 500:1 is permitted. As of now, we will be going in with the 500:1 leverage type for review purposes, but you are able to choose whatever leverage you want to play with.Once an account is created, this should be showing on the accounts home page. In order to log into the created account, just click login found on the further right-hand side of the account selection. As you guys can see, we have provided a trade window screenshot of a logged in demo account. Please be advised that their demo account has everything that a live account does. This means that the market is real, everything is real as per live account, the only thing that’s not real would be the balance you have a demo account. On the upper left-hand side of the trade window, we are able to see a small icon with a plus sign on it. To create an order, you just need to select this and the Order window will pop up. Inside the order window, everything can be changed from the type of trade you want to do the volume, stop loss and take profit options, and select if the order will be a Market Execution or Pending order. A successful order will be redirected to the Order tab below. Shown in the screenshot is the successful buy order number 2740532 placed at 3:08 AM with the size of 0.01 and with the pair BTCUSD. Every detail of a successful order can be found below and a registered user can close the trade anytime by clicking on the trade number and selected close trade. Classic and Pro Accounts – Here at Evolve Markets, as mentioned earlier they have two different account types. The Classic account has the available commission built in the spread. On the other hand, we’ve got the Pro account which has a tighter spread to the latter but charges commission per trade. Spreads range from 1.0 pips for Classic and 0.0 pips for Pro Accounts. What we liked about this website is the fact that a registered user can play around with their demo account. Demo accounts let you feel that trading excitement without the cost of anything but with all the fun connected to having a real live account within your reach. We also noticed that the trading platform layout is easier to understand compared to other trading platforms today. Already mentioned earlier in this review, we would just like to emphasize the importance of having a demo account on every possible trading website out there today. Though not all websites offer such feature, they try to weigh it with something else important, like trade insurance or lesser fees. As a team, we always thought in general that a good trading website should, and always have a demo account. What are other features worth mentioning? Aside from their demo account, they also have the ability to give you, the registered user a way to choose your leverage personally and not wait to have it approved or looked into by the website’s team. The leverage selection on this website is something that you need to put in mind as you don’t see this every day. Now that we’ve looked into how to trade, how to create an account and looked into the website features, it’s time to know how to get our funds in and out of the website. As mentioned all throughout the review, we now have a concrete idea that this website circles around Bitcoin. This means that all withdrawals and deposits are based in BTC. 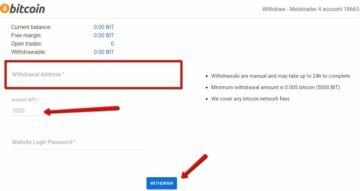 To deposit BTC into the selected account, just click on Add funds and this will open up a separate deposit window. The deposit window will have a pre-generated address connected to your live account. Please be advised that only live accounts are able to be funded. If your BTC wallet has a QR scanner, this can also be used to deposit money into the account. They also have the ability to accept Shapeshift payments which can be accessed by clicking here. To withdraw money from your account, just head on to your account and select which account you want to withdraw funds from. Add funds window, a selection overhead can be chosen between deposit and withdraw, please select withdraw and a separate page will open up that would look like the provided screenshot above. On the withdrawal page, everything can be seen from your current balance, free margin, open trades available, and the withdrawal amount possible. Please be advised that you do need to provide your BTC wallet address. The minimum amount that can be withdrawn is 0.005 BTC. As stated on their website, withdrawals are manually approved and could take up to 24 hours to complete and there are no withdrawal fees are charged. We have always expressed how much we think customer service is important when it comes to websites that handle money. It is your responsibility as a trader to know that if something goes wrong with a trade, you would have not just one channel to reach out to that website. Here at Evolve.Markets they have a Bitcointalk.org thread wherein questions and issues can be posted easily. Aside from their forum thread, customer service can also be easily accessed through the secured client area. On the screenshot shown above, we’ve got the Live Chat and contact us buttons. The live chat button when clicked would bring up a chat box on the lower right-hand side of the screen. The contact us is the link to their email support system. Here you are able to send them an email and get direct updates sent to the attached email of your account. What they lack on this website is a phone number that their customers can call in case they need prompt help. As we all know, phone customer service is always better than live chat or email since hearing a person’s voice over the phone is much better compared to both of the mentioned channels. But despite the lack of phone service, we think that the provided channels are enough to cater our needs. What are people saying about the website? Before transferring funds to a website may be it Fiat or Cryptocurrencies, it would always be great to know more about what the people are saying about a certain website. Do they have negative reviews or issues that you might want to keep in mind? Knowing these issues beforehand creates a sense of awareness to people that want to create an account on the website. Doubt is one of the reasons why people do not trust a website, especially if that website is new. This is what we’ve read about what people think Evolve.Markets are all about. The same thread in Bitcointalk.org where the website was introduced is a couple of comments regarding not being a website that should be trusted due to the nature of not being registered and whatnot. Mentioned earlier in this review, we have talked about the website not being registered in any form of a regulatory body, which would make people think that they are not legit. This is exactly what we’ve been talking about earlier and it has obviously made an effect in the forum threads. There are a few claims that the website is a scam due to drastically changing prices but they do not have any proofs on the accusations that they are calling out on them. If you do have any proof of any issues with the website, please do let us know in the comments section below. What have we learned from this review? 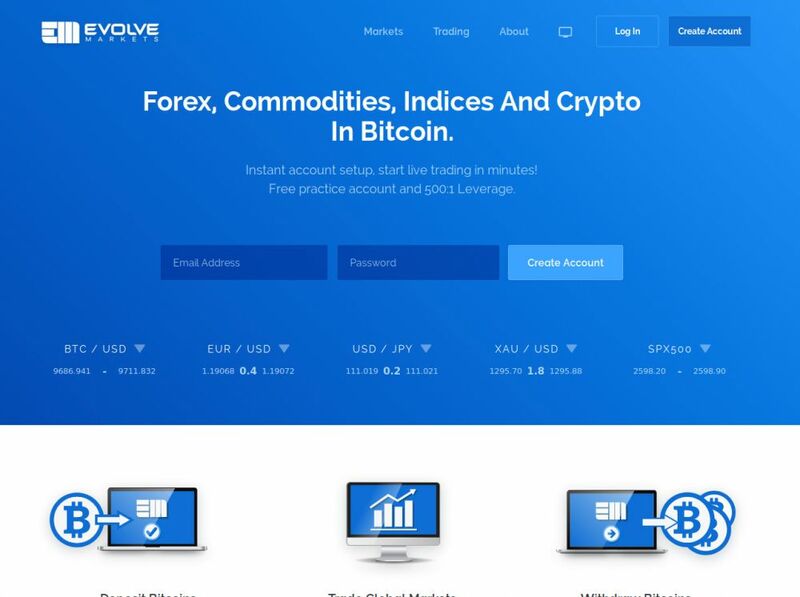 We have learned that Evolve.Markets is a new website that offers almost the same as different trading websites today. 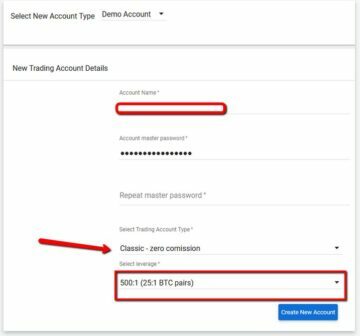 They do have a demo account that can be used so that practice trades can be done with all the features of a live account. The account creation process here is as easy as 1-2-3, and US registrants are welcome. The most important thing though, is that they are not registered in any regulatory body that oversees their funding. Unlike most of the trading companies today that have regulatory bodies looking over them, here, they don’t have one. There’s also an upside when it comes to having BTC as the main currency due to the anonymity it gives out but most websites today that accept Bitcoins does not accept Fiat deposits, this is also one of their downsides. All-in-all, we suggest to read more about the negative comments about the website since they are fairly new, issues aren’t known or have been reported yet. In regards to David’s negative review, he emailed our support the following day disputing this trade. After investigation of tick data we confirmed a bad quote on USDJPY from our liquidity provider and the trade was eligible for reimbursement . He was fully refunded for the trade and the matter was resolved.